During Japan’s lost decade in the 1990s I found myself handing out rice balls to Tokyo’s homeless on the banks of the Sumida river. The former salary men — it was always men — slept in cardboard boxes the size of coffins. I peered into one. Its owner had neatly arranged his last few possessions. Crockery, two wash rags and a blanket were all emblazoned with the designer logos I associated with Japan’s boom years when I had lived in Tokyo. They had washed up like artefacts from another age in this unlikely setting. They signalled more than anything else to me that Japan’s economic miracle was well and truly in the past. Financial Times Asia editor David Pilling lived in Japan for seven years. His latest book, Bending Adversity, does an excellent job of reappraising those lost years of economic deflation and social and political stagnation. His argument is simple. What happened to Japan is now coming to the West. After the collapse of Lehman Brothers and the subsequent global financial crisis, nearly every western government faces similar problems to Japan. We had better get used to living if not in a cardboard box then at least in a life without growth. The book emphasises the resilience of the ordinary Japanese in comparison to a corrupt and arrogant political culture. ‘What Japan needs is a really good earthquake,’ advocated one senior official from the Ministry of Finance as an answer to Japan’s economic woes. Well he got his wish. The 2011 Tohoku earthquake and tsunami was so ‘good’ it shifted the earth on its axis and killed 19,000 people. Whether it has fixed Japan’s economic problems is open to question. a ghostly dust rising from buildings that were collapsing in the water’s path. The eerie white powder floated ahead of the wave like some terrible omen of death. Later Pilling sees two women picking their way through a landscape of rubble. One holds up a sieve she had found, all that was left of the café they had owned, a small, familiar object in the midst of desolation, ‘It’s a bit pathetic, isn’t it?’ she says. 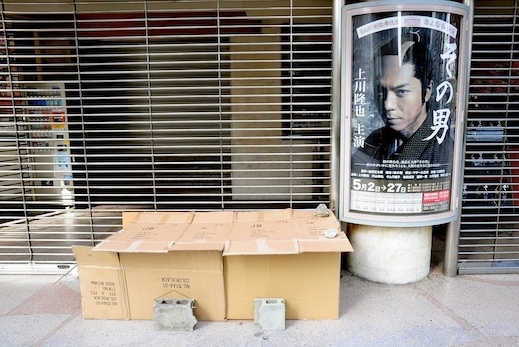 The inhabitants of the cardboard boxes on the Sumida river had been middle-class salary men. Japan experienced first what has now become an EU phenomenon. The impoverishment of the middle classes and the growth of inequality is the result of international trends, says Pilling — particularly the incorporation of hundreds of millions of Chinese workers into the global workforce after Beijing joined the World Trade Organisation in 2001. Japan is a stark example because its population is not merely stagnant but ‘on the verge of rapid decline’. In 1960 11 people of working age paid for every person over 60. By 2055 it will be 1.3 workers supporting every retired person. So what can Japan teach us? Certainly, living in Tokyo during its boom years was a lesson to me that economic growth does not necessarily translate into a better quality of life. The majority of Japanese paid a harsh cost for their country’s success. We see something similar in London nowadays. The city is booming from record population growth. But as you are forced to stand on the train tomorrow, to search fruitlessly for a place at a nursery school or somewhere to live or rent, how happy or wealthy does that make you feel? In Japan, as in the EU, it is the young who bear the brunt. Pilling explores their disillusionment as they struggle in poorly paid temporary work, are forced to live at home with their parents and marry late, if at all. They display a previously unheard of attitude in Japanese society: gambaranai — ‘don’t try too hard, don’t stress yourself’. This is in contrast to the 82-year-old man Pilling found picking through the wreckage of his house after the tsunami. ‘Gambarimasu,’ he declared, ‘we must struggle on’. A year later he had rebuilt his house. There has to be a way, says Pilling, that we can live without growth. This fascinating and timely book shows us where to look for it. What are the Chinese up to in Africa?